The Establishing Shot: The Establishing Shot: The brilliant Lymelife is coming to DVD! The Establishing Shot: The brilliant Lymelife is coming to DVD! Infidelity, family feuds and first love combine in the Network Releasing DVD debut of LYMELIFE, available to rent and own on 23rd August 2010. I was fortunate enough to catch a preview screening of Lymelife. I say fortunate as this bitter sweet film is wonderful. A warm slice of 70s American life. Told from the point of view of Scott Bartlett (Rory Culkin) a "shy Star Wars loving teenager obsessed with feisty girl next-door Adrianna (Emma Roberts)". It really captures the nostalgia of the 70s, coming of age, family life, the consequences of adult decisions and their impact. All round the acting is superb and impressively under stated but the real star of Lymelife is the world that Writer/Director Derick Martini creates it will sweep you away and keep you engaged. There are some hear warming moments that will make you smile while easing you into the tension building to it's conclusion. A great little film with powerhouse performances. An excellent ensemble cast make this a powerful drama with many darkly comic moments. It will appeal to fans of quirky independent films such as American Beauty and The Ice Storm. The brilliant Lymelife is coming to DVD! 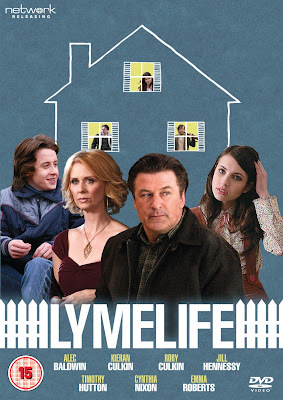 Lymelife will be available to rent and own on 23rd August 2010, RRP £14.99.